So, you’ve been to Mexico and the Caribbean and want to try something new for your next beach vacation with the kids. Enter the Buenaventura Golf & Beach Resort Panama, Autograph Collection in Rio Hato, Panama, about three hours from Panama City. Formerly a JW Marriott, this resort provides a luxurious escape for families. The five-star property features a multitude of amenities and services for families, including eight swimming pools (with one just for kids), a kids’ club, teen lounge, and, opened in 2017, its own wildlife refuge! The Buenavaentura Wildlife Center serves as a conversation area and rehabilitation center for local wildlife. The expansive resort also features kid-friendly restaurants, a relaxing spa, a Jack Nicklaus golf course, and a beautiful stretch of sand and surf. All accommodations feature private terraces and most can accommodate families. The four-bedroom villas are especially perfect for large groups, with fully equipped kitchens and private plunge pools! Bonus: The Buenaventura Golf & Beach Resort Panama doesn’t charge any hidden resort fees! Accommodations at the Buenaventura can best be described as simple elegant; they're just the right amount of luxurious for families. Each unit offers beds with comfy pillowtop mattresses, a mini-fridge, coffeemaker, flat-screen TV, and best of all, a private terrace with a table and chairs! (It's the perfect place to enjoy room service breakfast). All accommodations have air conditioning and fans, as well. Cribs and rollaway beds are available upon request, as are connecting rooms. Guestrooms span 527 square feet in size and offer one king or two double beds. Families can choose between the following options: Resort View (views of the onsite chapel and gardens), Garden View or Pool View. Premier Rooms are larger than standard guestrooms, spanning 635 square feet. They offer a living room and overlook the lake and pools. Suites, of course, are even larger, at a whopping 1,044 square feet! They have one king bed only and are best suited for couples (we're looking at you, grandparents.) They have a separate living room and a spacious bathroom with a multi-jet tub and separate shower. Upgrade to the Buenaventura Suite for a dining area. The villas are absolutely perfect for families, with space for eight to 10 guests. There are four bedrooms (three with one king bed; one with two double beds) and five bathrooms (so nobody has to fight over who's showering first!). Villas are a luxurious 4,305 square feet in size and feature private terraces with plunge pools and barbecue grills; fully equipped kitchens; dining rooms; and living rooms. The resort fronts a gorgeous, private stretch of sand and surf. Lounge chairs and umbrellas line the beach, and a lifeguard is on duty when the resort is busy. There are eight pools in total at this resort, one of which is designed just for kids. Tip: The main pool at El Faro Beach Club is the perfect spot for a selfie, with pool and distant ocean views in the background! 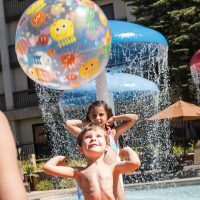 The resort's kids' club -- designed for children ages 4 to 12 -- offers half- or full-day programming with treasure hunts, arts and crafts, water sports and more. There's a separate lounge for teens, with pool tables, air hockey, and video games. There is no cost for kids to visit the kids' club. The resort also hosts sports camps via the American Sports Academy (ASA); they're available during select weeks in July. 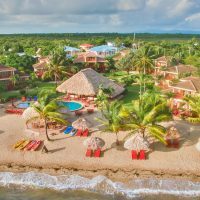 The resort offers parasailing, kayaking, paddleboarding, snorkeling and more via Extreme Adventures. Additional fees apply. Visit the sports club for basketball, tennis, and volleyball. You can also come here for bike rentals and horseback riding. Make time to visit the resort's wildlife refuge, where you'll see peacocks, deer, alligators, monkeys and more. Our favorite is Geoffroy's Tamarin, native to Panama. They are tiny monkeys with tiny faces! The wildlife refuge is free for resort guests to access. Visit the onsite Mua Mua Museum for local artisan workshops and customized activities for kids. This is a great way to bring some Panamanian culture to your family beach vacation. All of the resort's restaurants are family-friendly, with kids' menus available at Criollo, Tagua and Faro/Asao & Pescao. Highchairs are also available for young children. Located at El Faro Beach Club, Asa'o & Pesca'o specializes in seafood and prime cuts of steak. The covered, outdoor restaurant overlooks the pool. 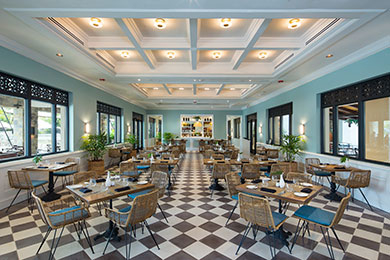 Situated by the beach and pools, El Faro Beach Club serves paellas, pizzas and other light fare for lunch. Tapas with a Panamanian flair are served at this dinner-only restaurant. The cocktail and craft beer selection is fantastic. Visit Criollo for with a delicious breakfast spread. You'll enjoy local delicacies (plantains, beans, tostones), plus traditional Western dishes such as eggs, omelettes, pancakes and bacon. Hoyo 19 is located at the golf course and serves delicious steaks and cocktails. Do not miss this bar; we repeat, do not miss this bar! Master mixologist, Miguel Diaz, concocts some of most unusual, delicious cocktails you'll ever taste. When we visited, he made us a drink in a lightbulb (yes, you read that right) and another one that involved cotton candy and dark chocolate. Need we say more? Kids are welcome and Miguel will happily whip up a virgin cocktail for them. The Buenaventura conveniently offers 24-hour room service. Tip: Order a traditional Panamanian breakfast to enjoy on the terrace with your family! The resort has a small, 24-hour fitness center with cardio and strength training equipment. Cool towels and fresh water are provided. The resort also has a fitness trail for those who'd prefer to enjoy their workout outside. Babysitting services can be arranged, either prior to or during your stay. Valet parking is complimentary to guests. The Buenaventura is popular with Panama City residents, who like to escape here on the weekends and during Panama's summer, which takes place between December and April. Local children are on their summer break from school during this time. They go back to school during the rainy season, which takes place between May and November. Don't let the rainy season deter you from a visit, though -- you can enjoy lower rates and have the resort practically to yourself. It's not easy to get to this resort -- a three-hour drive (factoring in traffic) is required -- but the experience you'll have once you arrive is absolutely worth it. If you don't want to make the drive after a long flight, plan to spend a day or two in Panama City, where you can visit the historic Panama Canal, stroll through colorful Casco Viejo, or take a local excursion with Ancon Expeditions of Panama. Visit Panama City Family Hotels for our recommendations; we highly recommend The Santa Maria, A Luxury Collection Hotel & Golf Resort, which opened in 2018. It's easy to get to most of the restaurants and pools by foot, but you'll want to catch a ride to El Faro Beach Club, where several pools and the beach are located. You'll also need a ride to get to the golf course and Hoyo 19. The staff will happily provide transportation upon request. If you like to golf, you'll love the Nicklaus Design championship 18-hole and par-72 championship golf course at the Buenaventura. Discounted rates are available for kids ages 5 to 12. Especially fun is the Cobra Performance Training Center. Corotu Spa offers five treatment rooms for services that include massages, scrubs, facials, manicures and pedicures. Prenatal massages are also available for mothers to be (psst... babymoon). Before or after your treatment, relax in the hydrotherapy area complete with rain showers, saunas, and Jacuzzi tubs. Massage services can also be arranged by the beach or in your room. After the spa, enjoy handcrafted cocktails by the beach!